Blog: Knott's Berry Farm Adds Metal Detectors! 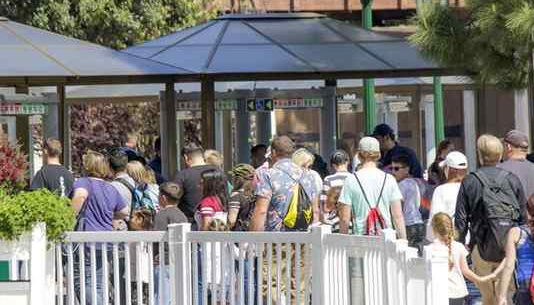 Knotts Berry Farm has begun using metal detectors to screen park guests, becoming the latest Southern California theme park to upgrade its security measures. Knotts officials describe the metal detectors, which began getting installed a couple of weeks ago at the entrance to the park, as part of a larger security program. Similar measures are also deployed at Disneyland, Disney California Adventure, Universal Studios and Six Flags Magic Mountain. The installation of metal detectors at our park is part of the ongoing evolution of our security practices, said Cherie Whyte, a Knotts spokeswoman, in a statement. (It) is just one segment of a multi-layer security program, which is developed in coordination with local authorities. I think its a good idea, said Joanne Birdsall of Hawthorne, who was at Knotts on Tuesday. They just need to speed it up a little to go through them. Maybe put in an express lane for those with wheelchairs or walkers who cant stand out in the sun for very long. Brandon Sandoval, a Knotts season-pass holder from Monterey Park, also backed the metal detectors. At first I was thinking it would be a hassle, but for safety reasons I agree with it, Sandoval said. Before the metal detectors, I felt a little unsafe. It wasnt much more time to go through them, and I feel more safe. But Rachelle Ottosen, a visitor from Olalla, Wash., was upset she had to take a pocketknife she uses for self-defense back to her car. I feel unprotected now, Ottosen said. I believe in the Constitution and my rights to protect myself. What will happen if some whacko gets in with a gun or a knife? How do I protect myself? Theme park operators have long been tight-lipped about security measures. But in the wake of terrorism attacks worldwide and threats over the past few years, more visible measures such as metal detectors have quickly become the norm.